All Twisted Up About Gerrymandering? The Rotary Club of Lake Forest Park sponsored its annual Community Forum on Wednesday, March 21, 2019 at the Shoreline Center. 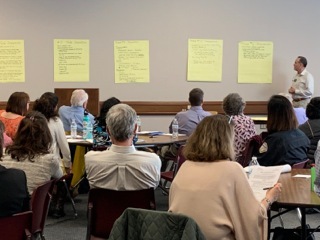 More than 35 community leaders from the Shoreline School District and non-profit organizations across Lake Forest Park, Shoreline and North Seattle gathered to collaborate in small group discussions facilitated by members of the Rotary Club of Lake Forest Park. Centered on a theme of homelessness in our community, participants collaborated to discover ways to recognize and meet the needs of family, youth, elder and Veterans' homelessness. Speakers included Heather Fitzpatrick, CEO of Wellspring Family Services and Jill Steinberg, Chair of the Shoreline PTA Clothing Room “The Works”. Rotary brings together a global network of volunteer leaders dedicated to tackling the world’s most pressing humanitarian challenges. Rotary connects 1.2 million members of more than 34,000 Rotary clubs in over 200 countries and geographical areas. Their work impacts lives at both the local and international levels, from helping families in need in their own communities to working toward a polio-free world. For more information, visit Rotary. Meetings of the Rotary Club of Lake Forest Park are held at 7:15am every Wednesday morning for breakfast at the Lake Forest Park Presbyterian Church, 17440 Brookside Blvd. NE, Lake Forest Park.